Food Blogga: What is a Persimmon? I was selecting persimmons at the farmers' market last weekend, when the woman next to me leaned in close so that the farmer wouldn't hear her and whispered, "I bought some of those last year and they were awful." "Really?" I asked, surprised that anyone could use the words "awful" and "persimmon" in the same sentence. "Yeah. Especially the ones with the pointy bottoms. They're so bitter," she added. "You mean like a green banana?" "Yes! Exactly!" she said, and gave an involuntary shudder. "That's because you ate it when it wasn't ripe. 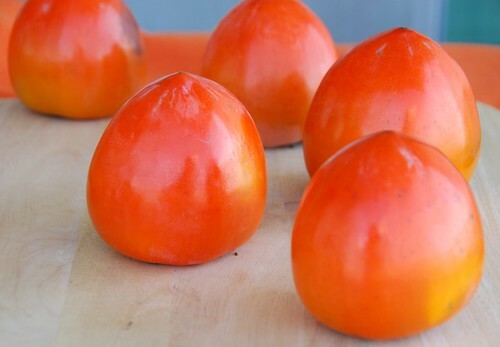 Those are called Hachiya persimmons; they need to be really, really soft before you eat them." "Well, someone told me that I could eat persimmons like an apple," she said, confused. "Yeah, the Fuyus, not the Hachiyas. There's a big difference." "Well I wish I had known that last year. I ended up using them as a centerpiece for my Christmas table, then threw them away." Threw them away? That's when I involuntarily shuddered. That's the problem with persimmons. Eat an unripe Hachiya, and you could banish them from your life forever. But, oh, what a mistake that would be! A ripe Hachiya is pure bliss -- glossy, jelly-like coral colored flesh that tastes like sweet mangoes and apricots. I don't ever want anyone to throw away a persimmon again, so I'm here to help. Read on to learn all about persimmons. Though persimmons are well-loved throughout many parts of the world -- they are Japan's national fruit -- they puzzle many Americans who are unfamiliar with them. That's why it helps to have a well-educated farmer like Barry Karol of Karol's Tropical Fruit Farm to help you out. With persimmon season running from late October through December, Barry has been talking up persimmons a lot lately. Persimmons are a winter fruit, so I asked Barry why they do well in San Diego. He explained, "There are 14 climates zones in San Diego. It's actually the most diversified agricultural place on the planet. That's why persimmons grow so well here." You don't have to live in San Diego to enjoy persimmons; they are typically available in most supermarkets during the holiday season. Here are some pointers to help you select the best ones. Heart-shaped Hachiya persimmons have a shiny deep orange skin that may be streaked with black. Don't worry. Barry says those are just sun spots. Hachiyas are astringent, which means they can be eaten only when fully ripe. How can you tell when a Hachiya persimmon is ripe? Hold it in your hand. It should feel like it's filled with water and will be extremely soft and squishy. Removing the thin skin reveals coral colored flesh so thick and glossy it looks like jelly and tastes like it too -- it's an intoxicating blend of mango and apricot. Eat them plain or use them in baked goods, sauces, and smoothies. Just remember: DO NOT eat an unripened Hachiya. It can take up to a week to ripen, so to speed things up, place the fruit with a banana inside of a paper bag. The banana releases ethylene, which speeds up the ripening process. Fuyu persimmons in contrast are squat and rather heavy for their size. Their skin ranges from pale yellow-orange to brilliant reddish-orange; generally, the darker the color, the sweeter the taste. 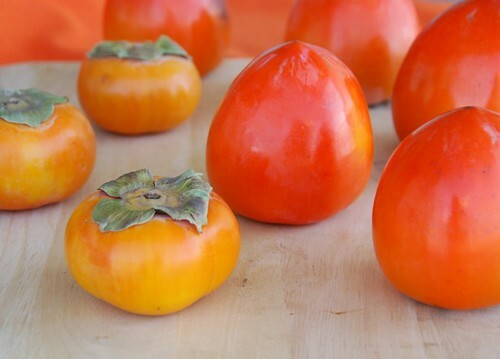 Fuyu persimmons are non-astringent, which means you can eat them either firm or soft. Firm Fuyus can be eaten like an apple, skin and all. And when you slice off the top, a beautiful star will appear in the flesh. Crunchy cinnamon flavored Fuyus are also great in salads and salsas. Persimmons are highly nutritious. One fruit packs 55% of your daily vitamin A. According to Barry, "Persimmons are high in beta-carotene. In their raw form they're more nutritious; once they're heated, they lose some of their nutritional value." I hope that I have saved at least one more person from the horrifying experience of eating an unripe Hachiya. So please, this holiday season, eat persimmons instead of just using them in your centerpiece. If you're in San Diego, then check out our amazing farmers' markets. You can catch Barry at the Little Italy Farmers' Market on Saturday mornings and the Hillcrest Farmers' Market on Sunday mornings. He doesn't have a web site, but he gave me his business card with his email: barrykoral [at] hotmail [dot] com. I'm sure he'd be happy to hear from you if you have questions or comments. I confess - The prolific Hachiya persimmon tree in my back yard yields hundreds of fruits each year, but I only use them for decorations and give the rest away. I tried one when we first moved here a decade ago and spit it out. I will try the soft, overripe-looking fruit. Very informative Susan...I think I had the same experience as that lady and threw them out! Now I'm a little more wiser thanks to you. After reading your post, I can't believe that I've *never* eaten a persimmon. Maybe I heard something bad about them somewhere along the way, I'm not sure... but now I'm going to buy some! Thanks for a very educational post ! That is a fabulous, informative post, Susan, and could save many a persimmon from the compost pile. Well done! And that sundae... decadent, scrumptious, words can't begin to describe. Thanks so much for the information. I enjoy persimmons, and have definitely fallen into the naivete-trap of eating an unripe Hachiya. I love the trees in the winter, void of all greenery with only orange persimmon decorations hanging on the brown branches. I only recently tried a persimmon for the first time. It was interesting. Another thing to add to my grocery list! Thanks Susan for all the information on persimmons. I have never tried any before. I'm so glad to see all your words of love for the fabulous persimmon - I adore them (but have fallen foul of a few mouth-puckering ones too!). They never last long enough to be baked with in my house! I saw persimmons at the grocery store recently but couldn't remember which type had to be completely ripe before eating it. I need to make a little cheat sheet from this post so I'll remember next time. And now that I've read your apricot-mango description of how they taste I'm anxious to buy some. Thanks for the great information on persimmons. The sundaes sound like a wonderful combo - I'm definitely going to give them a try! Great post Susan! Very informative. It makes me crave for a nice, fully ripe, Hachiya right now (i love the picture by the way). Hope you had a great Thanksgiving! Very nice information. Now I am going to have to try one. It is one of the few things I have never eaten. I seldom see the Fuyu persimmons here in Rhode Island. And I'm guilty of using the Hachiya as table decoration more than in my cooking. Sometimes I'm really jealous of California produce. Thank you, I will be trying persimmons next time I go to the market! I am actually excited! I've always love to try it but haven't had time to do research. 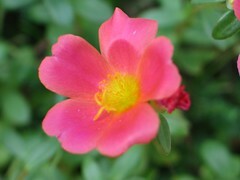 I am so happy to have come across your blog!! I will be following your posts! rosa-The Fuyus are my favorites. rita-Probably they'd be too delicate to remain on the tree. the Fuyus are wonderful if you ever see them. christine-That's awfully kind of you to say. Thanks so much. lynda-They are lovely, aren't they? rosie-Ooh, I hope I have inspired you! lysy-I'm glad you didn't give up on them! lynne-They are heavenly. Trust me. zen-I enjoyed snapping the photos too. I did have a lovely holiday. lisa-Never? Oh, please go buy some! mark-YOU'RE WELCOME! :) And please try the sundae. They're amazing! epicurean-Welcome! I'm so glad you found me and enjoyed the post. Take care! the first time I started eating persimmons was a while back when a friend went trhough cancer treatment and it was so beneficial for her...siince then, it has become staplefood. thanks for this informative post, now I knwo alot more! I LOVE persimmons - I have some of the soft ones sitting on my counter! These fruit are well known in Greece from ancient times and are mentioned in the Odyssey as the fruit of the Gods. They were so delicious that those who ate them forgot about returning home and wanted to stay and eat lotus (that's what we call them) with the lotus-eaters. We put them with apples in order to speed up their ripening. I have never seen the other pointed ones. Great post! I love persimmons! The sundae looks most fabulous! I used to see them scattered on the ground where I grew up-people just left the fruit to rot (fools!). I think the best thing I've ever done with persimmons is to place the cut fruit (well, more a blob at that point) under the broiler for a few seconds with some butter and brown sugar. A bit of sour cream when they come out. Oh my goodness. I've been thinking of you all weekend as I try to decide which Christmas cookies to bake this year. Thanks for some great info - I had both of these experiences this year - trying to eat an unripe persimmon from a colleague's tree and then having a lovely ripe one on a winter fruit platter! Must remember which to eat when winter comes around next year because when they are good they are very good and when they are bad they are horrid! Fascinating, great write-up. 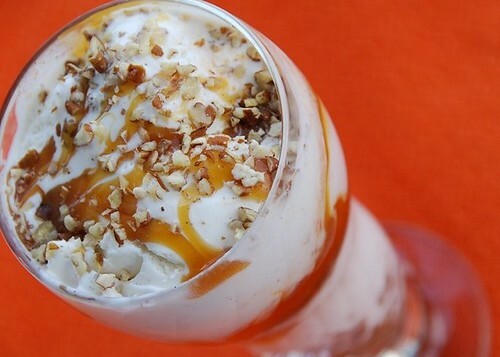 Your sundae looks devine. I was puzzled too, Susan. We don't get persimmons here in India so when I saw some in the market the other day I diddn't know what they were. I now know thy're Hachiya Ps. The shopkeeper couldn't tell me what they were other that that they were imported. I was tempted to check it out but the price he quoted for one fruit was what 1/3 of what I spend on my week's fruit!! ronell-That's a sad reason to start eating them. I hope she is better. But I'm also glad you've been introduced to them and love them now. johanna-I'm glad you didn't give up them though. 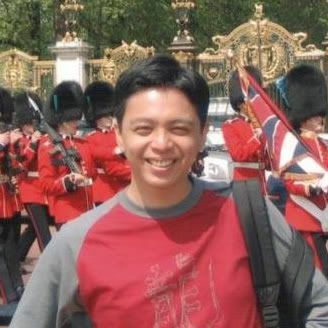 marc-Thank you! I'm glad you enjoyed it. aparna-Wow? That expensive? I'm sorry to hear that. They're about $2 a pound here, which is reasonable. I do enjoy the larger, sweeter and less starchy large persimmons and I guess that's why they are more expensive in the markets. One of my fave fruits...wish they were available all year. Thank you for the photos, Susan. I would've never known they had to be that soft! wow i've never had them in sundaes before! i grew up eating persimmons...sometimes raw, sometimes ripe...but i never knew you could only eat certain ones raw, i just ate whatever my mom gave me :) have you ever had the dried ones? the ones you have to soak in water before eating? i love those too. Susan, I thank you for this post. I have never had a persimmon before though I may have been one while on one of my visits to the US. Thanks so much for this. I have never really known what to do with persimmons. My paternal grandparents used to grow them, but they were always a mystery to me and I have never tried them. Thanks for the tips and the informative post. Ok, next time I'm taking you with me to the Farmer's Market. Clearly I need a Personal Persimmon Coach! Susan, you have me licking my lips here and we just had supper!!!! The Sundaes are beautiful!!! I have a confession to make: I never knew what a persimmon even looked like until a couple weeks ago. I was at my grocery store and next to the pumpkins and the corn and the apples on sale, was a bin of this odd cross between what looked like a tomato and a pepper. It wasn't labeled or anything and I was completely confused. Since I always associate persimmons with Christmas and we don't celebrate Christmas, I concluded that those must have been persimmons (and they were!) Thanks for the education - I'll have to try one this year! broken english fighting over the persimmons, they were definitely the Fuyus type. She kept saying to her husband.."you don't know how to picka them, move, move,!" I guess you had to be there, it was hilarious! Oh how I love persimmons (especially Hachiya!). I make a point of telling everyone I know to try them and not to eat it until it feels like a water balloon and making them squeeze any I have around to show them. Best fruit ever, lol, even if my zeal for them makes me look a little crazy! Thanks so much for clearing that up for me, because I never knew what they were. You are amazing Susan. Thanks for the great post! I love parsimmons... the soft ones. We have a tree at home in Italy and last winter we got so many parsimmons... I hate 2 per day! So good! For whatever reason this fruit is called Japanese apple in my country of origin (the rounded, shorter one), at least in some places, and it's my husband's favorite! He loves it, it grew in his region of Croatia. peter-At least they're worth the price, huh? I love them too. jaime-You should taste them in sundaes! Oh, wow! They are soooo delicious. I have tried the dried ones. They're super good. cynthia-I hope you get to try one soon. tw-I'd be happy to come along! nina-Yay! that's what I like to hear. annie-I'm so glad I could help. Thanks! orchidea-2 a day? That's heaven. medena-Now, you can enjoy them with your hubby. I'm glad you enjoyed the article. cris-Fuyus are my favorite too. Thanks for the vinegar tip! sue- You're welcome! Make sure the Hachuyas are fully ripe. Cut off the stems. The skin is edible, so I would leave it on, unless you don't like the texture. Place them in freezer bags (removing as much as air as possible from inside the bag) and pop in the freezer. Good luck! I love these fruits myself, and I am pleased t say that no-one else in my family likes them! One question though. Sometimes there are dark areas INSIDE the fruit, is this due to their ripeness and are they still edible, perhaps as a ripened banana can have dark areas and still be edible? graham-I'm so happy to hear you love them too. I would say if it's a a minor darkness, it's OK. If it's really darkened and/or has a funky smell rather than sweet, then I'd pass on it cause it's old. Thanks for the great question! I subscribed to an organic farm that delivers whatever is in season..I got Kale, tangerines, spinach and apples..I also got one persimmon. I have a friend that bakes with them..and is always looking for them. Because I have certain food allergies and the comments others have made, I have always avoided them. Today, I decided to cut the one I got and see what it was about, with benadryl on hand. I did skin it and ate the inside..delicious!! I will buy these going forward. I care for my Alzheimer's stricken father and he loved it too. A new snack for us...the vitamin content intrigues me also..thanks for the info. I found it on a google search for Fuyu persimmon, which is what I got. 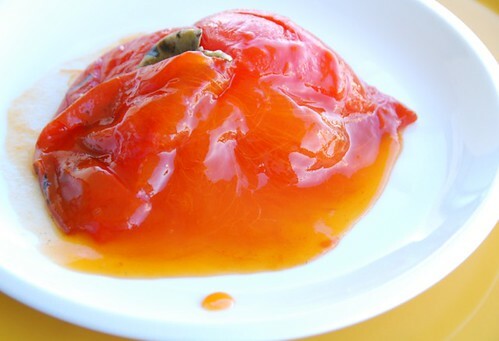 Hi Susan... came here searching for more uses of persimmon and this wonderful lesson delighted me. I am snacking on the really yummy luscious fruit in the most natural form and wanted to cook with it . the bread recipe looks great and i will be baking that rich bread soon. The salads are great too . sangeeta-Thanks so much! I'm happy you found new recipes to try. Hi Susan...... I am from Trinidad/ Caribbean. Yesterday I tried persimmon for the first time. 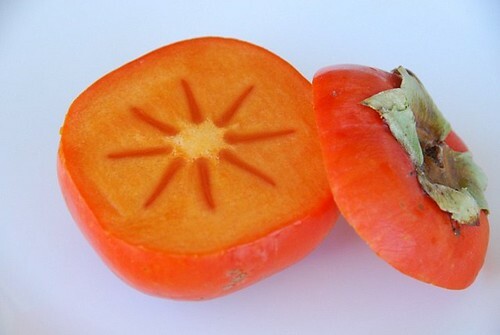 I found it to be quite delicious and similar to a fruit which we have here called a"caimite" Hope we continue to import persimmons.Thanks sharing the info on this fruit.